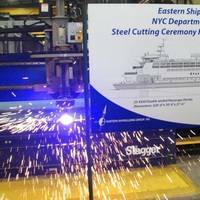 The City of New York Department of Transportation (NYCDOT) Staten Island Ferry Division and Eastern Shipbuilding Group, Inc. (ESG) cut steel to officially begin the construction of the first of three new 320’ Staten Island Ollis Class Ferries. The steel cutting ceremony held August 29, 2017 took place in Eastern’s steel processing and pre-fabrication building at its Allanton facility in Panama City, Fla. Attending the ceremony from Staten Island Ferry Division was John Collins, Director of Ferry Engineering and Bill Tomalonis, Vessel Construction Manager SIF Division. The Ports of Indiana handled nearly 3.9 million tons of cargo during the fourth quarter of 2016, the highest quarterly shipment total in the organization's 55-year history. The total surpassed the ports' previous quarterly record set in the second quarter of 2015 by 300,000 tons. The state's three ports' shipped nearly 11.3 million tons in 2016, the second highest volume in history and the third consecutive year the ports exceeded 10 million tons annually. Since 2014, the Ports of Indiana has handled 34 million tons of cargo, the highest three-year total since Indiana's ports opened. 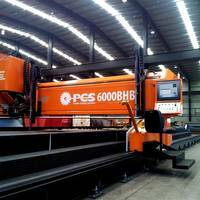 POSCO, a multinational company headquartered in Pohang, South Korea, and the fifth-largest steel producer in the world, has announced plans to build a wire rod processing center at the Port of Indiana-Jeffersonville, creating up to 60 high-wage jobs by 2018. POSCO is South Korea's fourth largest company, behind Samsung Electronics, SK Holdings and Hyundai Motors, and is ranked No. 162 in Fortune's Global 500. "Although we are located on different continents, South Korea and Indiana both share a reputation of excellence when it comes to advanced manufacturing," said Governor Mike Pence. Processing of steel for Hull's 476, 477, 478 and 479 started on sheet-cutting machine in Shipbuilding Industry Split on 12 November 2015. It is the Multipurpose Container vessels contracted for the company Brodosplit Navigation Ltd. Ships will be 184.43 meters long, 27.5 meters wide and 15.80 meters high. Their individual deadweight at 10.30 meters draft will be 24 thousand tons, and they will be able to carry 2000 TEU (20 feet/6.1 m long container). 18-knot speed will be secured by engines with power of 11060 kW at 100 revolutions per minute. 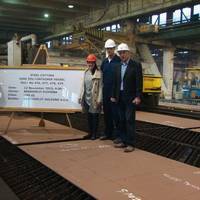 Processing of steel for Hull 483 started on sheet-cutting machine in Shipbuilding Industry Split on 22 September 2015. 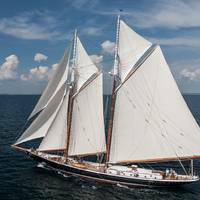 It is the largest square-rigged ship contracted for a Monaco buyer, the company Star Clippers Ltd. 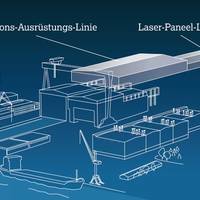 It will be 162 meters long and 18.5 meters wide, with deadweight of 2000 tons, five masts and sails with overall surface of 6.347 square meters. The type of Clipper sailing boat with such sail-plan is called barque. Marine platform that will be at the the stern will be equipped with the mechanism for opening and lowering until the sea level so that the passengers will have the direct sea access. The ship will have steel construction while the deck will be fully covered by the highest quality teak. 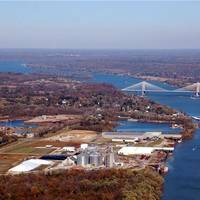 The Port of Indiana - Jeffersonville handled over 2.4 million tons of cargo in 2014, up 48 percent from the previous year, according to a news release from the port. This was the first time annual shipments exceeded two million tons in the port’s 29-year history. The 2014 total was 464,000 tons higher than the previous record set in 2006. Another outstanding harvest in 2014 helped push grain tonnage to its highest volume ever breaking the previous record set in 1993. Steel and salt shipments also set all-time records, up 72 percent and 51 percent from 2013, respectively. The Port of Indiana-Jeffersonville handled over 2.4 million tons of cargo in 2014, up 48 percent from the previous year. This was the first time annual shipments exceeded two million tons in the port's 29-year history. The 2014 total was 464,000 tons higher than the previous record set in 2006. Another outstanding harvest in 2014 helped push grain tonnage to its highest volume ever breaking the previous record set in 1993. Steel and salt shipments also set all-time records, up 72 percent and 51 percent from 2013, respectively. For the year, the port handled approximately 1,300 barges, 197,000 trucks and 18,000 railcars. "These robust year-end numbers illustrate the impact our port companies have on the region's economy," said Ports of Indiana CEO Rich Cooper. 11 N. With four yards, Signal offers new construction, rig and ship repair, offshore and technical services. 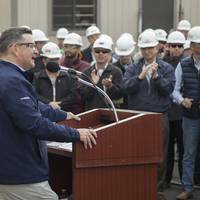 The new construction facility in Orange, Texas has undergone a major transformation over the past several years, including the addition of a new panel line and steel processing facility. 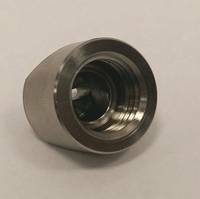 The Pascagoula facility handles rig fabrication and repair and has improved automation as well as dredging a deep hole for thruster work and space for storage of offshore equipment. 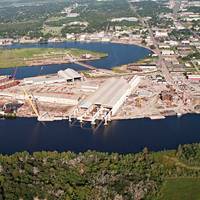 The 30,000 ton Dual Carrier/heavy lift dry dock is located at this facility. With a family of three yards located along the Gulf of Mexico in Alabama, Mississippi and Texas, Signal International offers new construction, rig and ship repair, offshore and technical services. Marine construction and repair needs are complimented by three dry docks; a 30,000-ton lift rig dock, a 22,000-ton Panamax dry dock and a 4,500-ton lift dry dock. In Mobile, Ala., Signal Ship Repair (SSR) offers 4,400 ft. of water front along the Mobile River with a maintained channel depth of 44 ft. This facility specializes in ship repair and conversion. According to reports, projects implemented by the Turkish Ministry of Transport in the last four years to increase shipyard capacity and efficiency have started to bear fruit. The ministry took the shipyards’ demands for growth as their priority and development plans were approved by the Ministry of Public Works. The Tuzla Shipyard and Tourism Co. has reached a capacity to build 45000 deadweight (DWT) ships. Employment rose from 13,000 in 2003 to 28,500. Shipbuilding capacity rose from 654,000 DWT to 1.4 million DWT. 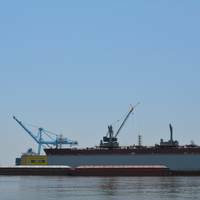 The amount of sheet steel processed in shipyards has doubled. Turkey’s worldwide market share in shipbuilding has risen from 0.9 percent to 1.4 percent; making Turkey fifth place in shipbuilding, right behind Germany who occupies fourth place with a share of 3.6 percent.